Here’s a list of the top holy places in India to get divine blessings. 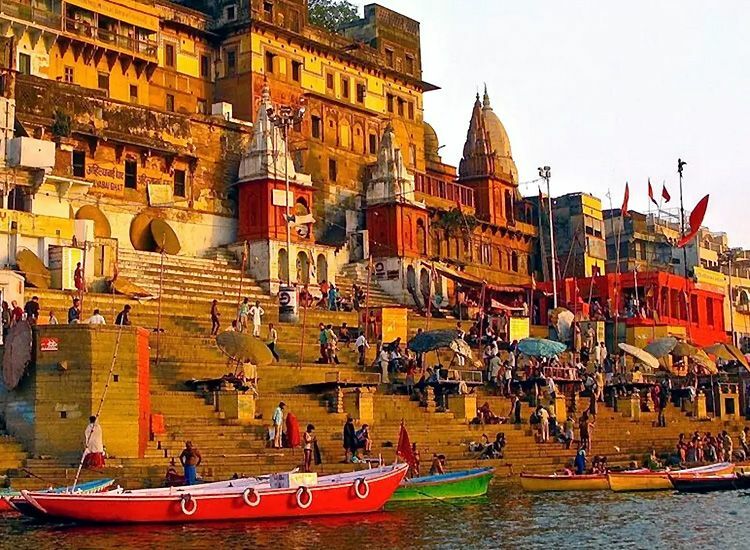 Believed to be one of the oldest cities in human civilization, Varanasi is among the top spiritual places in India. Owing to the presence of the holy River Ganga, ancient temples and the spectacular ritual of the evening Ganga Aarti, the city is visited by pilgrims from all over the world. Varanasi is divine as it is witness to the circle of life. Interestingly, dying in the sacred town is said to help attain salvation. The river ghats are witness to the Hindu rituals of birth to death. Offer prayers, take a ceremonial dip in the holy River Ganga, and attend the divine evening aarti and bask in spiritual bliss. The very ambiance of Varanasi is reason why it is among the must visit destinations in India. By Air: Lal Bahadur Shastri Airport in Varanasi is the nearest air connection. By Rail: Varanasi Junction is the nearest railway station with train connectivity. By Road: Well-connected network of roads lead to the city from all over India. Best time to visit: November to March is the ideal season as the weather is perfect and also it is time of festivals that only enhance the spiritual experience. Where to stay: Varanasi has abundant of options of budget accommodation near the river ghats. Heritage hotels to ashrams, the city caters to all kinds of visitors. Pray at the Kashi Vishwanath Temple, one of the twelve Jyotirlingas of Lord Shiva. Go temple hopping, the city has abundant options. Sunrise or sunset boat ride on River Ganges. Visit Sarnath, the ancient Buddhist pilgrimage site. Sit on a river ghat and enjoy the world go by. Attend the Ganga aarti in the evening. 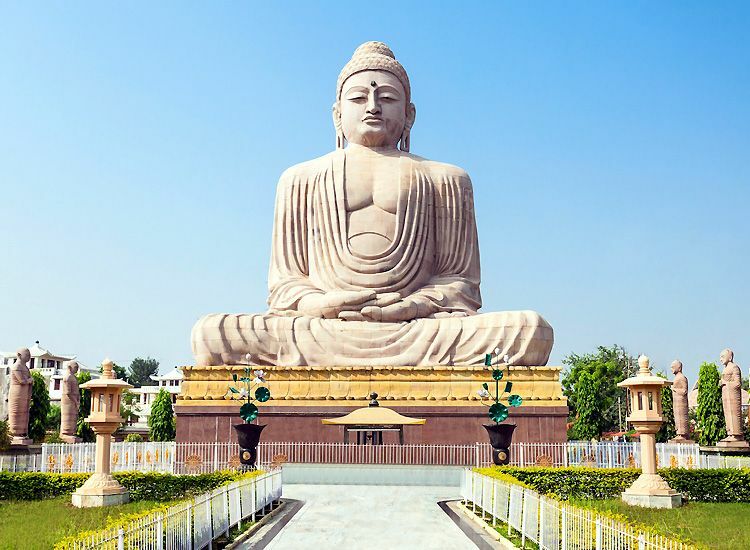 The holy town where Lord Buddha is said to have attained enlightenment and found Buddhism, Bodhgaya is among the top religious places in India. It is the most revered site for Buddhist pilgrims in the world. While the ancient town is home to many holy Buddhist temples, the most important landmark is Mahabodhi Tree where the divine phenomenon occurred. Pay a visit to the Mahabodhi Temple Complex, which is one of the UNESCO World Heritage Sites. The saffron robed monks in prayers and the divine bliss is the reason of its popularity as the Buddhist pilgrimage in India. By Air: Gaya is the nearest airport, 12 km away. By Rail: The nearest railway station is Gaya Junction with frequent train connections from all over India. By Road: The holy city in Bihar has well-laid network of roads accessible from all over the country. Best time to visit: October to March offers the perfect weather conditions to visit Bodhgaya and it is also the time of various festivals held in the town. Where to stay: There are abundant options to stay in Gaya. From the monasteries, budget hotels, to boutique hotels, there is accommodation of every category for a visitor in the town. Marvel at the Great Buddha Statue. Pay a visit to Wat Thai Buddhagaya. Pray at Animeshlocha Stupa, Ratnachakrama, Ratnaghar Chaitya, Ajapala Nigrodh Pillar, Lotus Pond, Rajyatana Tree, etc. Circumvent the remnants of the Mahabodhi tree under which the Lord penanced. 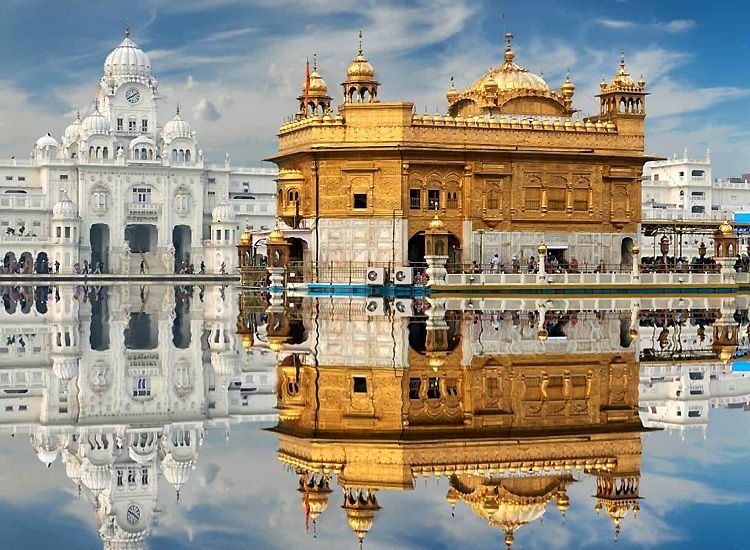 Next on the list of the top holy places in India, we have Amritsar. The divine pilgrimage site for Sikhs is as pious as its name. In the local language it means he ‘pond of elixir’, and is truly the same. The shrine of the Guru Granth Sahib, it is a gold-domed temple, The Harmandir Sahib Gurudwara. 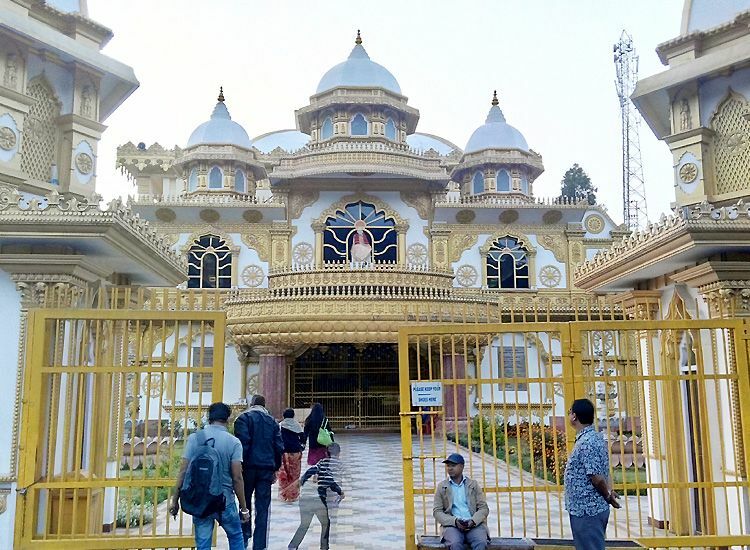 Receiving devotees of all faiths, the holy temple is blessed with divine bliss. Serving mankind, the shrine is known for the langar prasad that pacifies the weary soils. The melodies of the hymns, the soulful setting amid the glittering waters of the tank lend an ethereal feel to it. By Air: Sri Guru Ram Dass Jee International Airport in the city has flights connecting to the cities of the country as well as international provinces. By Rail: Amritsar Railway Station has frequent connections to other cities in India. By Road: Network of well-laid roads are available to get to the city. Best time to visit: The months between November and March. The days of the martyrdom and birth of the saints and the festival of Deepavali are absolutely ideal to get the blessings of the divine. Where to stay: Accommodation is found in the Golden Temple complex but it is mostly on first-come-first-serve basis. There are also options of budget rest houses and luxury hotels. Volunteer to serve the mankind with your service. Pay homage at the Durgiana Temple. Moving on, we come to the foothills of the Himalayas. Haridwar and Rishikesh are two holy sites in India owing to the presence of the sacred River Ganga flowing through it. Haridwar is counted among the seven holy Hindu religious places in India. 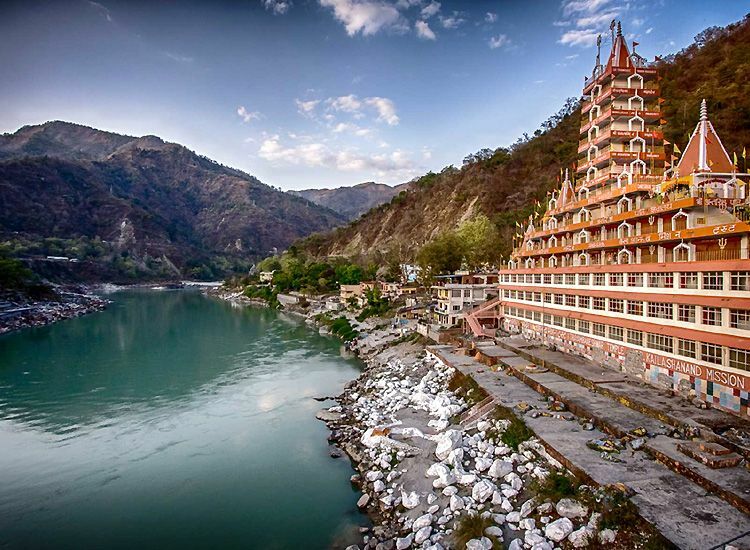 Rishikesh is the land of ‘rishis’ where yoga is said to have originated. The river flowing here from its glacial origins is truly blessed. Both the towns are home to a number of ancient temples. Also, the ritual of evening Ganga Aarti is held in both places and is equally a spectacular sight. Haridwar gets devotees in huge numbers as it hosts the holiest gathering of Hindus, the Kumbh Mela, along with 3 other places every 12 years. A pilgrimage to Haridwar and Rishikesh is said to absolve of all sins of a lifetime and also attain salvation. By Air: The closest air connection is Jolly Grant Airport in Dehradun. By Rail: The railway station in the town is connected with frequent connections from all over India. By Road: Both of the cities are connected to the capital city Delhi with well-laid roads and expressways. Best time to visit: October to June is the ideal season to plan your visit. Diwali, the festival of lights is absolutely breathtaking celebration here, one you must visit. Also, the occasion of Kumbh Mela is also worth visiting. Where to stay: There are plentiful options of accommodation in both of the towns. From riverside ashrams, budget hotels, campsites and hotels, there are choices for travelers of every budget. 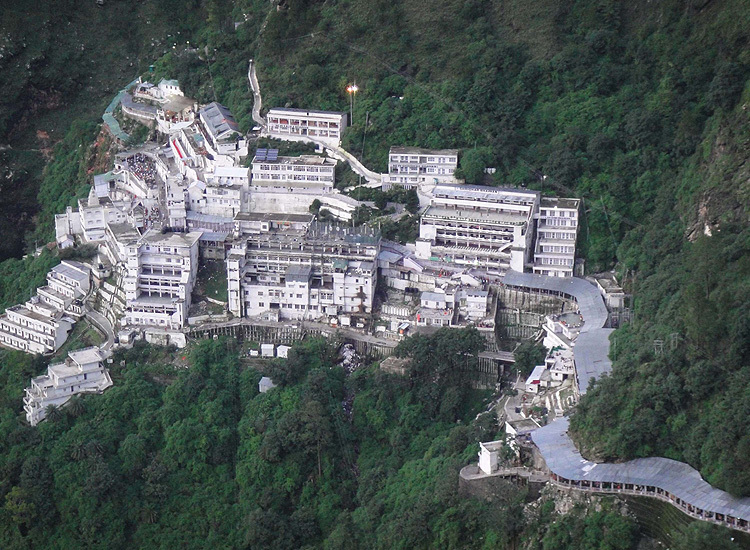 Among the most popular religious places in India, Vaishno Devi Temple is like a prized crown of the country. Dedicated to Goddess Shakti, it is a cave shrine located in Jammu amid the three-peaked Trikuta Mountains. The Mother Goddess here is worshipped in the form of three pindis- Maa Saraswati, Maa Lakshmi and Maa Kali. The revered deities represent the preserver, the creator and the destructor. The holy temple is set a 13km from Katra, the base of the Trikuta hills. The journey is almost 6-8 hours’ by foot with options of ponies, palkis and also helicopter packages that save time and hassle. By Air: Jammu Tawi Airport is the closest air connection, 50 km away. By Rail: Shri Mata Vaishno Devi Katra Railway Station is at a distance of 20 km. By Road: Well-laid roads lead from Jammu and other places in India. Best time to visit: All through the year, except the months of monsoon, generally July to September. The 9-day festival, Navratra is the busiest time as devotees form all over the world visit for blessings. Where to stay: Lodgings are found in abundance in and near the pilgrim town. While there are guest house, dormitories and halls in the cave shrine, there are options to board on the way as well as in the town of Katra. Trek the 13 km route from Katra to the cave enjoying the beautiful views. 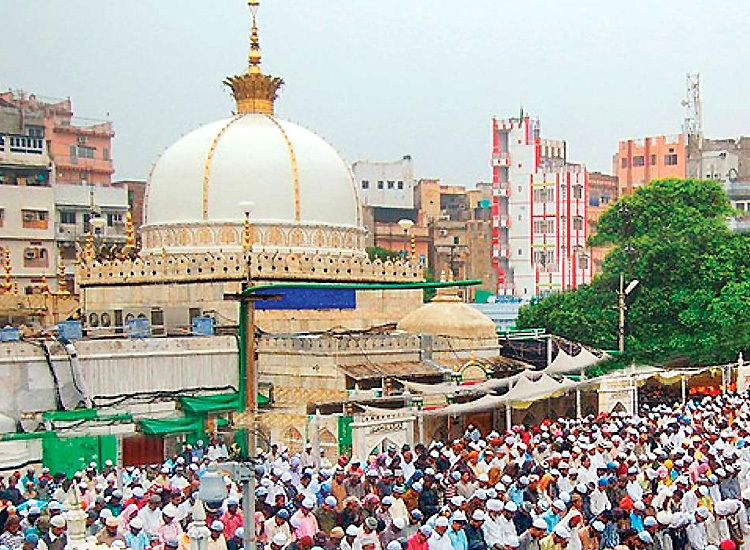 Named among the most popular holy shrines in India, is the revered dargah of the sufi saint Moinuddin Chisti in Ajmer. Visited by Muslim pilgrims and people of all faiths, the saint is said to fulfil heart-felt wishes. While devotees pay respects all throughout the year at the Ajmer Sharif Dargah, the numbers increase on certain days. On the 6th and 7th of the seventh Islamic month, Rajab, on the death anniversary of the saint, the shrine feels all the more divine. Pilgrims visit the shrine with flowers and perfume. The Quran reading sessions, the Sama and divine Qawwali is the dose of ultimate spiritual bliss. By Air: The Sanganer Airport in Jaipur, at a distance of 135 km is the nearest airport from Ajmer. You can further book a cab or board a bus to get to the city from the air terminal. By Rail: Ajmer Junction in the city has frequent trains. By Road: Well-connected road connects Ajmer from Jaipur and durther to Delhi and other parts of the country. While Char Dham is not one but four holy religious places in India, it is one of the holiest pilgrimages for Hindus. Settled in the lap of the Himalayas in the “Dev Bhoomi’ the char dhams in Uttarakhand are, Yamunotri, Gangotri, Kedarnath and Badrinath. 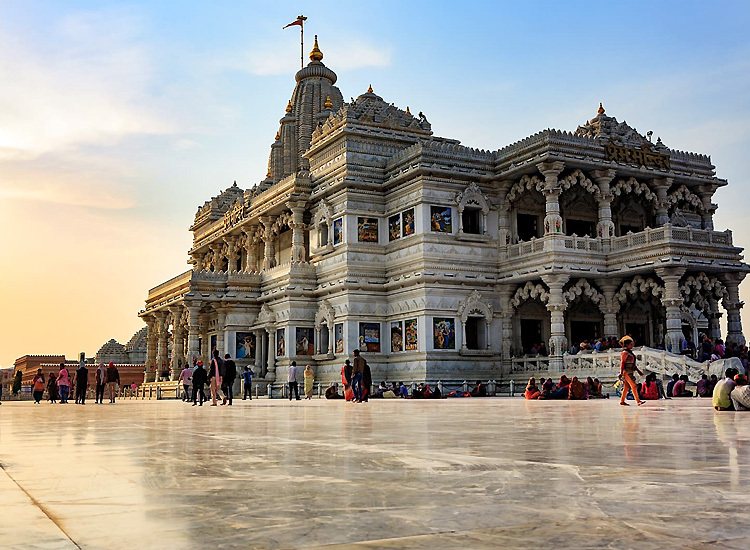 Visit to each of these sacred destinations is said to cleanse the sins of a lifetime and attain salvation from the constant circle of life and death. Start with Yamunotri, the origin of River Yamuna to get the blessings of the river Goddess, the sister of Yama, Lord of Death. Next, visit Gangotri, the glacial origin of the river Ganga dedicated to the divine Goddess Ganga. 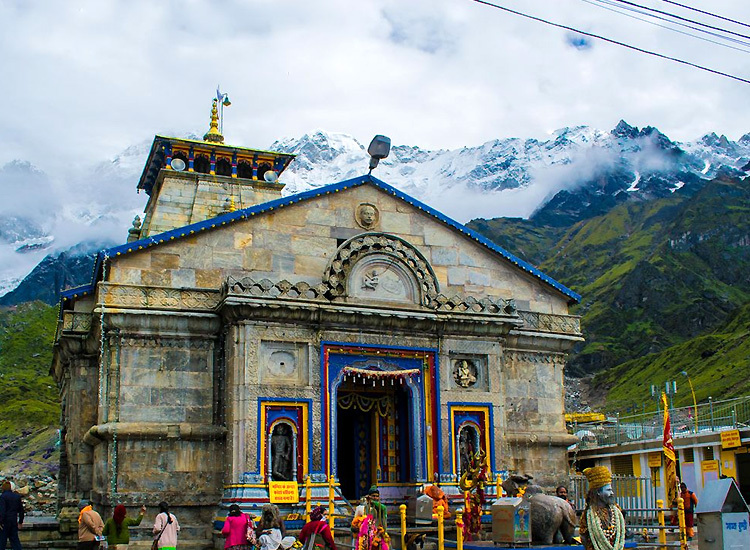 Kedarnath, one of the 12 Jyotirlingas of Lord Shiva. Lastly, visit Badrinath, the revered shrine of Lord Vishnu. All of the four places are among the holiest religious destinations in India. The spiritual journey comes in addition with the picturesque regions of Uttarakhand. By Air: Helicopter tours are available for Char Dham Yatra in Uttarakhand. There are helipads near all four of the shrines. The journey starts from Dehradun, Sahastradhara helipad. By Rail: The closest railway station is in Haridwar, from where you can leave for a visit to the holy destinations by road. By Road: These holy towns in Uttarakhand is connected by a network of well-laid roads. Best time to visit: April to November are the best months to visit. As these sites are located in the high mountains therefore season is the most important. Also, the temples of the four Char Dham have their own specific calendars with distinct opening and closing dates that change remain every year, but generally fall between April-May to October-November. Where to stay: Accommodation in all of the four holy destinations of Char Dham are available for all pilgrims of every category. From tent lodgings, budget hotels and dormitories, there are options at every town all through the journey. Lord Krishna is one of the most loved deities of Hindus and people of other faiths. Therefore, the holy sites of Krishna pilgrimage are among the top religious places in India. Settled along the River Yamuna, Mathura is the birthplace of the revered Lord while Vrindavan, Nandgaon and Barsana are the places where he spent his childhood and adulthood. All of these places are known for the various miracles he performed. Drenched in love for the lord, these cities have a number of ancient temples. Some popular ones are Bakey Bihari Mandir, Prem Mandir, Krishna Janmabhoomi Temple among many others. Divine bliss is in the very air of these pilgrim towns, which are further enhanced by hymns, chants and bhajans. By Air: The nearest airport is in Agra, Kheria Airport, 57 km away. The nearest international airport is in Delhi at a distance of 155 km. By Rail: The town has its railway station with frequent rail services are available from major cities from this junction. By Road: Yamuna Expressway connect Mathura from Delhi and Lucknow, while there are also a network of well-laid roads. Best time to visit: The months between October to March is perfect for visit owing to the ideal weather conditions. Also, the festival of Holi and Janmashtami are among the best time to visit the holy towns. Named among the most popular holy destinations in India, Tirupati is visited by devotees in huge numbers. 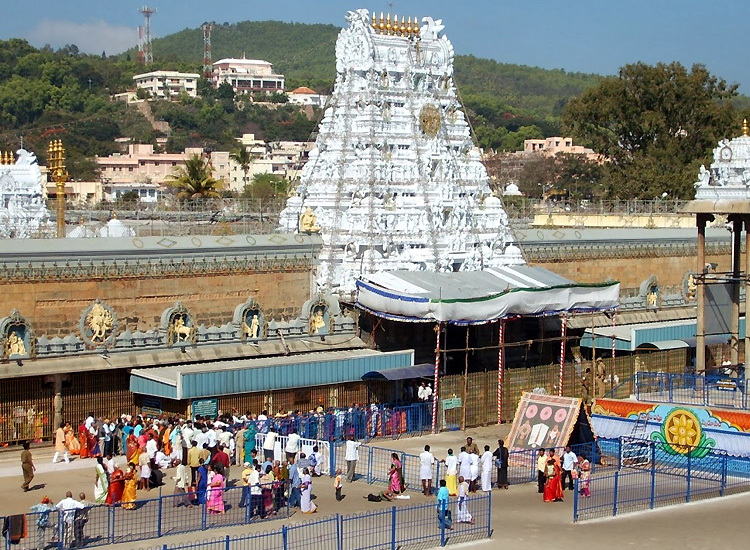 The town is home to the scared Tirupati Balaji temple, devoted to Lord Venkateshwara. Set amid the Seshachalam hill range in Tirupati, Andhra Pradesh, the temple is one of the sacred places in India. In fact, it is also one of the most visited religious places in the world. Like the holy temples in South India, Tirupati Balaji too is known for the exquisite architecture. The deity is ornamented in gold, diamonds and precious metals and is also the richest temple in the world. By Air: Tirupati Airport is the closest air connection, 13 km from the town. By Rail: There are three railway stations near Tirupati with frequent connectivity all over India. By Road: Network of well-connected roads lead to the holy site from cities in South India and the country. Best time to visit: All through the year is a good time to visit the holy site. Where to stay: Lodgings are available in all categories in and near the holy town. The holy home of the saint Sai Baba, Shirdi is among the most popular holy destinations in India. Visited by people of all faiths for the reverence of Sai Baba, the town is visited all through the year. The shrine spread the message of love and unity as did the saint in his lifetime. Chanting the words ‘Sabka Malik ek’, the fakir performed various miracles. It is said that the saint kept a fire ignited to burn all vices and evil and the very same ash is given to believers as a token of all his teachings. By Air: Shirdi airport is the closet air terminal with domestic air connection. By Rail: The town has its own railway station with frequent trains from all over India. By Road: The city is easily accessible by a network of well-laid roads that lead from Nashik and other important places in Maharashtra and the country. Best time to visit: October to March is the best time to visit Shirdi. Where to stay: There are plentiful options to stay in the pilgrim town. Dharamshalas, hotels and lodgings are available in all categories and budgets.